Over the years, I’ve seen many site-specific dance performances at Shawl-Anderson Dance Center; a plethora of choreography, movement and narrative set amidst the sizable Victorian house bordering Berkeley and Oakland. Witnessing dance unfold in all the nooks and crannies of this East Bay artistic beacon (which marks its sixtieth anniversary this year) is always a special treat, though of course, some projects resonate more than others. Friday night’s performance of Twisted Oak Dance Theater’s Constants & Variables: Second Homes, directed by Colin Epstein, was one that stands out. Certainly for the technically grounded contemporary dance, but mostly for its celebration of the Shawl-Anderson institution and all that happens within its walls. A place that, as the piece’s title points to, has been a home for this region’s dance community, for dancers young and not-so young, for those just starting out and for those who have been called to a professional career. Constants & Variables: Second Homes’ pilgrimage through Shawl-Anderson began on the first floor with its two studios and large welcoming lobby area. Through a myriad of duets, trios and groups sequence, the cast of eight would fully explore the space, highlighting its familiar aspects as well as its hidden delights. In the first few chapters of the dance, the structural and architectural details of the house came alive, almost like pas de deux partners for the company. Walls provided counterweight, banisters were balanced on, windowsills transformed into resting surfaces, railings on the outside front entryway acted as acrobatic apparatus. The excavation of the entire edifice meant not only were we seeing dance in surprising places and on unexpected planes, but also that the bodies and the space were truly in conversation with each other. This dialogue continued as half of the group embarked on a movement discovery around the lobby’s couch. If you were like me and found this particular chapter to be a little on the long side, all you had to do was look up. 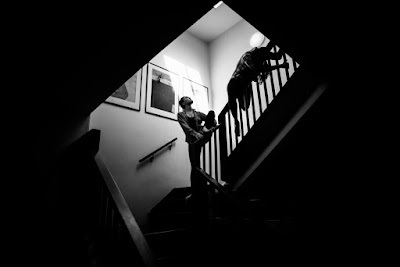 Above the scene, a stunning counterpoint was underway as the other cast members investigated the staircase. They helped one another navigate a dual journey, one aboil with porousness and purposeful uncertainty. Which way should they go? Up or down, to the right or to the left? Eventually they committed to the next level, leading the audience toward the upper studios. With a delicious combination of winsome and eerie elements, a film tribute to the space’s six-decade legacy awaited us upstairs. In the winsome camp was a choreographic foot fantasia that spoke to the range of movement styles studied within the walls. It ended with the dancers donning different types of footwear: a ballet slipper, a sock and an old-school wedged tap shoe. That final option made me a little wistful – might percussive dance be part of the current curriculum sometime soon? On the eerie side of the coin, the film was filled with ghostly apparitions. Hands crawled through the cubbyholes of the dressing room; bodies appeared and then slowly faded away. Were they spirits from the past? Or the present? Maybe a bit of both. As we moved to the second upstairs studio, we encountered four dancers standing ready to begin their physical practice. Yet another sequence of highly technical and compelling choreography followed. Moments from class were abstracted beautifully - barre warm-ups, center exercises, even primping in front of the mirror. The only minor challenge was with intention. It was hard to discern whether the movement was meant to be in unison or if it was to be performed with each dancers’ own individual, internal timing. Either would work, it just wasn’t clear. The mobile logistics in Constants & Variables: Second Homes were handled well. Moving a large audience through some rather small spaces is its own choreographic achievement and save for a small group of us that got a little waylaid in the upstairs studio, it was impressively accomplished. I will say that without a program, my observations about the dancing and the performances couldn’t be anything but general. Twisted Oak had opted not to print programs for the event and instead have the dancers quickly introduce themselves at the end of the performance (the cast is also featured online, but a number of the photos don’t show their faces very well). I completely understand the environmental reasoning behind this choice, but maybe there could have been an alternative. Perhaps a ‘who’s who’ board as we entered?